For tech-savvy advertising, print your promotional advertisement on one of our Stylus Pens. You can now advertise to the modern world with these modern pens and stylus's. Your custom imprinted message will be in style with these Stylus Pens. An additional $45 non-refundable artwork charge must be paid before work can begin. For logos or complex artwork, add an additional $25. Why sacrifice form for function? The Premium Stylus Pen takes a classic plunger-activated pen and makes it extraordinary with the addition of a stylus tip on the plunger. Colorful metallic-toned accents are set on either end of the metallic-toned barrel with a large imprint area. The iWrite Pen with Touch Screen Stylus is a modern pen that writes incredibly well and has a comfortable black barrel with 2 ring chrome design. It also includes the ever popular stylus tip. The large plastic barrel provides a large imprint area and the pen features a twist action retractable refill. 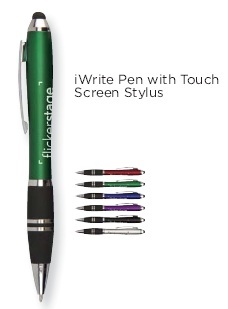 The iWrite is an excellent choice for companies seeking an inexpensive gift with guaranteed retention value. An optional black gift box can take this from just a versatile pen to a gift that will be appreciated. Who says that a stylus has to be boring? The iCrayon is a fun and functional way to get around on your touchscreen device. 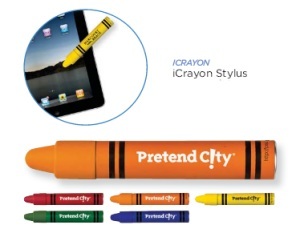 Available in a variety of colors, this crayon-shaped stylus is a great way to get your brand noticed. 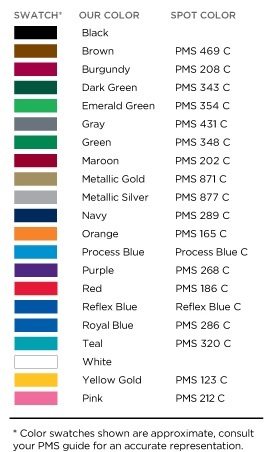 Custom PMS imprint colors are available for an additional $50 charge - please provide PMS color number. Light Up Pens - Selection of fine pens that light up. Great for law enforcement agencies, restaurants, truck drivers and other heavy equipment operators who need to write in dark places. Custom Printed Click Pens - Many more click pen styles available. We also offer many types and styles of customized pencils. Check the following pages or give us a call at 706-374-0710 and we will help you select the best pencil for your needs. Free quotes available. Personalized Pencils - Print your name over selected patriotic and other colorful designs.